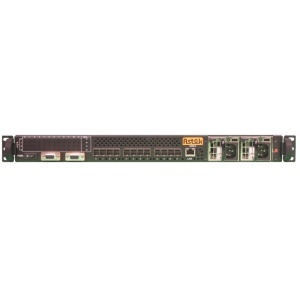 The Astek A54812-SW-02 Low Power/DataBolt is a 1U high, 12-port (48-lanes) 12Gb/s SAS switch configured with 12 x4 wide-port each capable of 48Gb/s . The switch extends the capabilities of SAS in direct-attached storage (DAS) environments by allowing multiple servers to connect to one or more independent storage systems. Astek's A54812 switch is designed to provide customers with an inexpensive and easy to use storage networking option for rack-mount server and storage installations in cloud computing, mega data-center and small- to medium-sized business (SMB) environments. By enabling storage resources to be shared across multiple hosts, and managed effectively through SAS zoning, Astek SAS Switch products help customers to maximize storage resource utilization, eliminate islands of storage and simplify storage management, backup and upgrades. For longer distance connections up to 100 meters the A54812 supports cable management and optical cables. The A54812 is designed for High Availability (HA) applications with features such as Dual Redundant Externally Hot-Swappable Fans and Power Supplies. Simple, plug-and-play integration is further enhanced by having complete SAS management available through a storage management utility. The utility is able to modify port configuration, including zoning, firmware management and viewing the topology of the SAS domain. It also offers flexibility to reconfigure without reconnecting cables or adding hardware. As the SAS physical layer supports both SAS and Serial ATA (SATA), the SAS Switch enables single switching infrastructure to address multiple classes of storage supporting a mix of SAS and SATA storage enclosures. A single SAS Switch can be used in a normal configuration, or two switches can be configured for a High Availability (HA) application where both ports of the storage are connected using redundant paths. If one of the switches fails, the second one will continue normal operation.